I’ve already posted a couple of times on my Toronto Transit Commission iPhone/Hipstamatic project, and now I can post the final slideshow video of what has come out of the project. I’ve added some audio I recorded of the ride between two stations on the line, a well as some original music. Timewarp Tuesday: One In a Million? 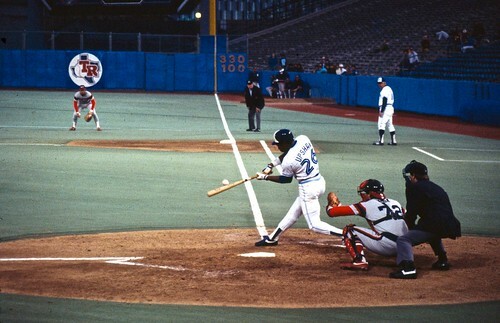 Today’s image “from the vault” is one I had forgotten about, and it is in so many ways from a different era: first, it is from a Toronto Blue Jays game in the early 1980’s, back when they played at the horrible Exhibition stadium. On the positive side, back then you could get a really good ticket (like I had for this game) for a reasonable price. You could also get a really horrible ticket for $1.50 in the outfield seats. I was shooting Ektachrome for this game, push processed to either E.I. 400 or 800, and the shot below, snapped just as the bat was about to hit the ball, was one in a million. 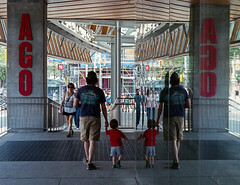 One advantage of my old Yashica SLR (compared to so many digital cameras) was no shutter lag; shutter lag would have made this picture impossible. Another one of those “the best camera is the one you have with you” moments. 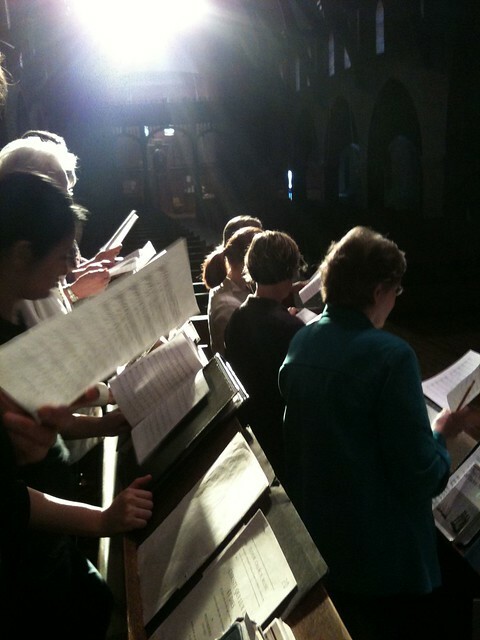 Yesterday, around 6 pm we were rehearsing for Evensong at St. Thomas’ Church in Toronto, and as we are getting closer to the Fall, the sun is lower in the western sky, and was streaming through a window, illuminating the choir. When the basses (including me) weren’t singing for a moment I pulled out my iPhone and snapped a couple of images. Many photographers have said that the key to a good photograph is getting closer; I had the good fortune to actually be inside what was happening here. If I had pulled out a large, loud SLR I’m not too sure the conductor would have been too thrilled though. 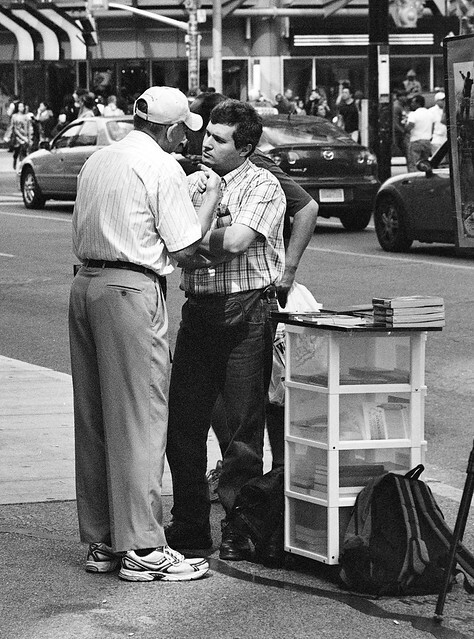 I was around Yonge and Dundas in Toronto last weekend with my old Nikkormat film camera, when I saw the religious debate pictured below. It was certainly a spirited discussion, but it did not come to blows, or result in any acts of terrorism or wars of aggression. I continue to be amazed at what images can be found riding the TTC (Toronto Transit Commission subway). There is a raw, gritty intensity to be found inside every subway car that I find irresistible. 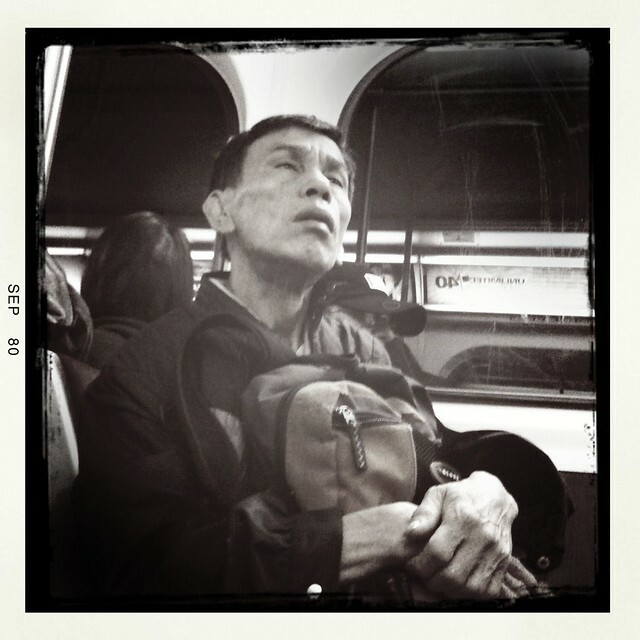 I continue to use the iPhone 3GS and the Hipstamatic app; so far, none of my subjects have been aware of me taking their picture. I feel though that eventually I will get caught out, and I wonder how the situation will play out. 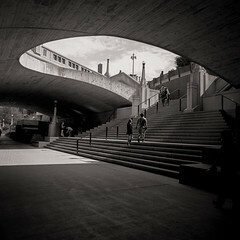 If I want to keep doing “street” photography, it is something I will have to deal with. I’ve been having fun (since I got my film scanner) of going back into my old negatives and scanning pictures I took decades ago, and posting the occasional one here, but I realize that this could be a trap if I’m not careful; I need to keep working on new images. I’ve decided therefore to only blog one older image a week, hence Timewarp Tuesday. I made this image below with my old Yashica TL-Electro, c. 1977 (the year I got this camera). The film was Ilford HP-4, push processed to either E.I. 800 or 1600, probably the latter, based on the amount of grain in the image. 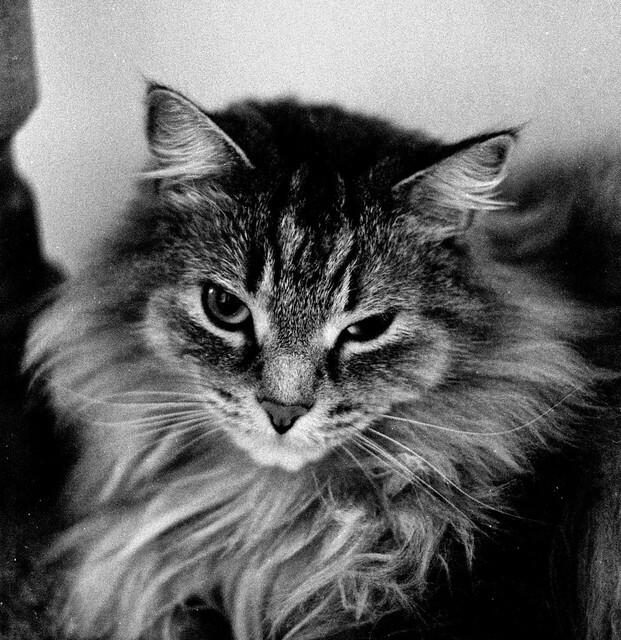 Our pet cat Murphy was the perfect subject for black & white; this rather scraggly domestic longhair was a furry grey scale; the only colour was in his eyes, but everywhere else he had every shade from white to black and back again. 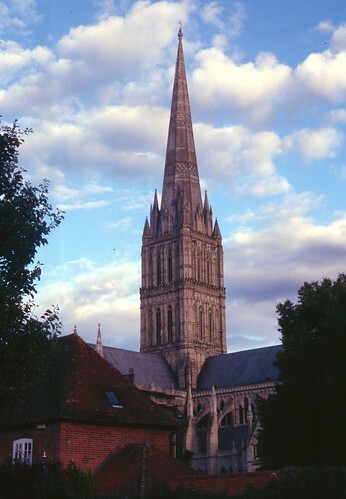 Same subject matter, same camera, same film; the only difference was an hour or so on a day in Salisbury, England, on a day when the weather was changeable to say the least. 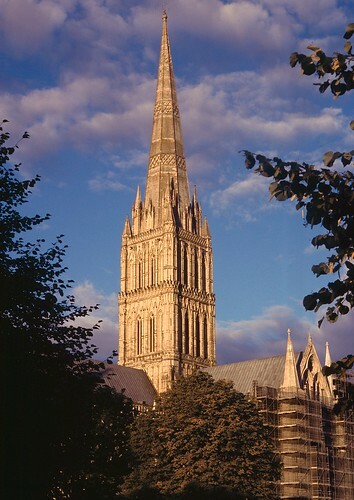 I was struck by how the light treated Salisbury Cathedral as a canvas later in the day, painting it with a golden glow.